On the site of the historic Falk's Market, Julie and Jeff Kinney have created a cornerstone in downtown Plainville with an indie bookstore, a café and an event space. An Unlikely Story Bookstore and Café is a beautiful new community gathering place where you can meet amazing authors, enjoy breakfast or lunch, or relax with your new book and a beer (or glass of wine). Previously owned by Merrill Falk - a beloved Yankee general store owner – the market served as a nerve center for the town. Taking care to honor the building’s history, we’ve made it our mission to rejuvenate this sense of community. Falk's Market, which was originally constructed across the street, was built in the mid-1800’s and it housed numerous businesses since its inception. 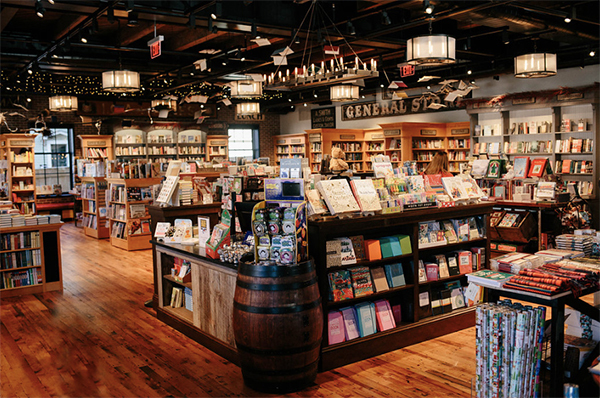 Part of our unlikely story is our evolution from general store to pharmacy to tearoom to restaurant…back to general store and now into bookstore and café. We invite you to please visit us, explore, and learn about the rest of our unlikely venture. Directly upstairs to An Unlikely Story is the Second Story. The Second Story hosts community events including readings, workshops, yoga, karaoke, wine tastings and game nights for families to name just a few. Our hope is that everyone who visits An Unlikely Story will find it to be a special place, and that we’ll be able to help you use this space in a way that allows you to create happy memories here.